I know, it’s a strange topic: why would a printing and design company care about visualizing wealth inequality? Kind of a long story, but the short version: we’re all affected by it, even if we don’t think about it day to day…and yet, in conversation with our friend and client Tom Trimbath, we discovered that actually trying to get our heads around the intangible scale of the numbers that factually describe wealth inequality, there’s no easy way to visualize it with the actual numbers. When dealing with a disparity where the numbers are literally 62 versus 3.5 Billion…there’s no way to show it. Tom saw a report released by Oxfam regarding the latest numbers…the numbers too big to comprehend – like attempting to reconcile the scale of the space between things in universe, or the number of stars therein. This report showed through a series of studies that whereas a few years ago, the equivalent wealth of half of the world’s population was concentrated in about 400 people. Versus half the world’s population. Yeah. It was that bad. Now it’s worse. In just a few short years, the equivalent wealth of half to the world’s population is now concentrated in only 62 people. How does one begin to understand a disparity that vast? Talk about inequality. The way most graphic designers and analytics folks (data visualization experts) do it is to make an infographic that takes very big numbers and uses a minute fraction of those numbers to display graphs and symbols representing thousands or millions of units… The problem with this is, we’re used to seeing just that: symbols representing hundreds of thousands, millions or sometimes, rarely, billions of some given unit. But no one, as of yet, has shown (to my knowledge) in the same graphic units numbering in the tens (62) and units numbering the billions (3.5 Billion). Tom Trimbath tried to illustrate this in words…and by dividing those large units into something smaller. He wrote an entire post on it, which was the results of having a Facebook conversation thread with a lot of input from various friends, myself included, as to how to tackle this problem. His post on the Extreme Displays of Wealth Inequality is here if you’d like a little background. And yet it’s still impossible, even if you divide that very large number of 3.5 Billion by the smaller number of 62…you get another very large number of 56,451,612. Not as bad as billions, for sure. But now try imagining a unit of one next to a display of 56 million of the same unit. Right. Can’t be done. At least not easily in a way that the naked eye can differentiate the individual units. Trust me, we tried. And this is where the answer comes in as to why a printing and design company would be interested in solving this issue. Since I knew that showing 3.5 billion of anything would be near impossible, I went with the smaller number. Why is showing 3.5 billion of anything impossible, with individual units? Look at it this way: if we go with an individual unit of a pixel, and try to create an image with 3.5 billion pixels – well…do the math. 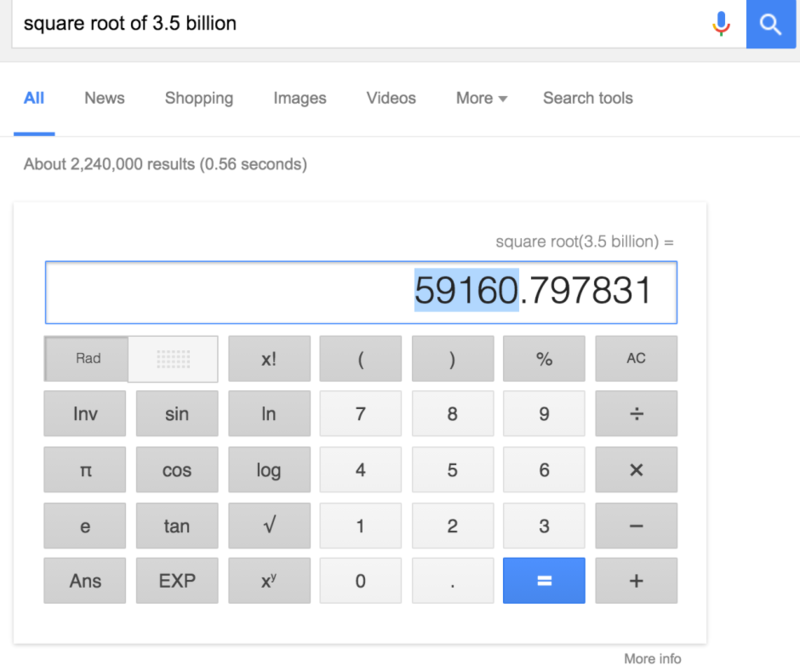 To find a square image with enough pixels, we take the square root of the total number of pixels we want, right? Right. This is a little bigger. Ok, a lot bigger. Like ten times as big. 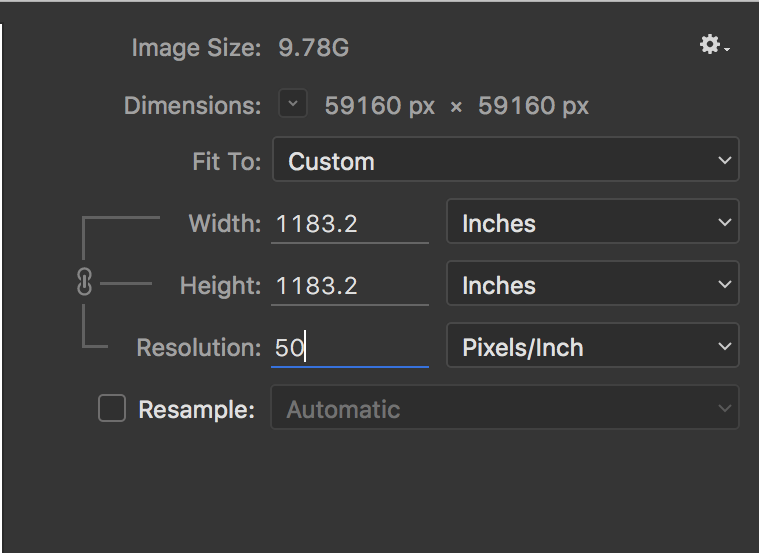 Ex: my Canon 5D MK II has pixel dimensions of 5,616×3,744. That’s a 21 megapixel file, give or take. 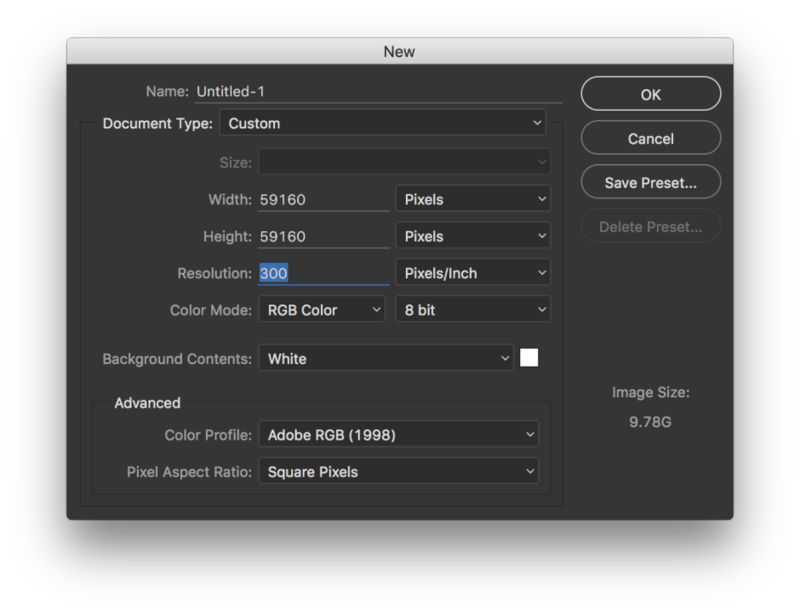 Here’s what it looks like in Photoshop when I create a file that’s the same pixel density as a photograph out of my camera. 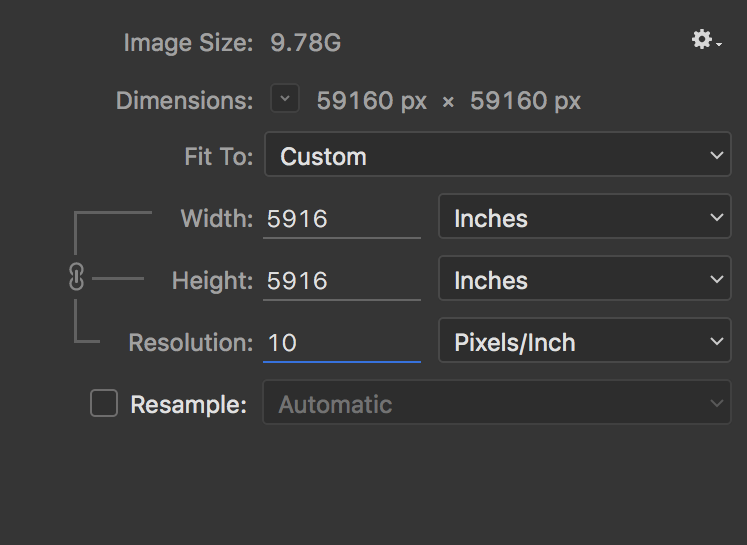 Now here’s the size file it would take to have one pixel per each of the 3.5 billion people that hold the same equivalent wealth as those 62 people. That’s a pretty big file. And here’s the kicker. We in the fine art printing world like to think in ideals, and one of our steadfast ideals is that for a good print, you don’t want to see the pixels. The industry standard pixel density – the “file resolution” – is often said to be around 300ppi. That’s 300 pixels interpreted into one inch of printed image on paper. Mind you, it’s not the same as how many dots of ink your printer lays down – that’s a different number entirely, which requires a blog post of its own (to wit: your printer puts down a couple thousand dots of ink as an interpretation of the 300 pixels it’s interpreting from the total pixels in a file, but I digress…again). 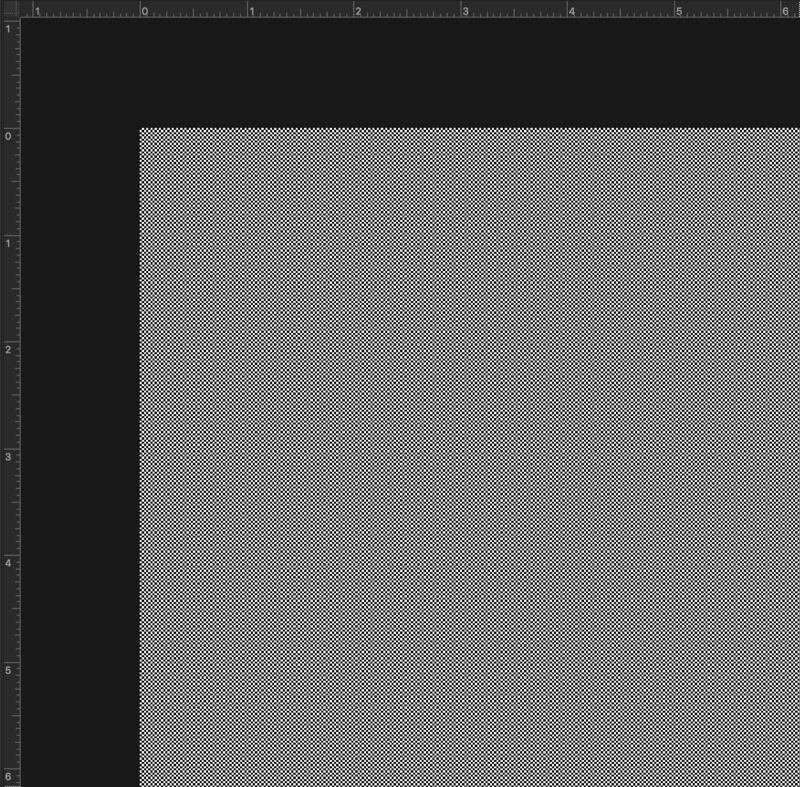 Ok – so…problem being, to represent such a huge number of pixels, we don’t want them to disappear. We don’t want a “good” print. In fact, we want a horrible print. What we might call “pixelated”…and to the extreme! We can’t see 300 pixels per inch with the naked eye. 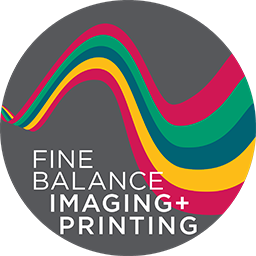 Most people are hard pressed to see the lower threshhold of a “good” print, which is about 150 pixels per inch. 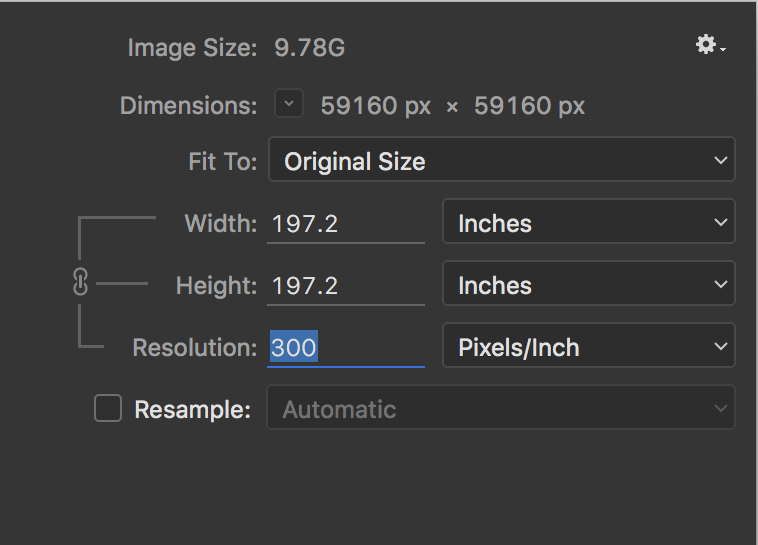 In order to SEE the pixels with the naked eye, the upper threshold is going to be about 50 pixels per inch. Now look at what size print you’d need to show that…with 3.5 billion pixels total. Alright. So…the worst print I can conjure would be about 10 pixels per inch. We’re surely going to see the pixels then. The image scaled at 10 pixels per inch. 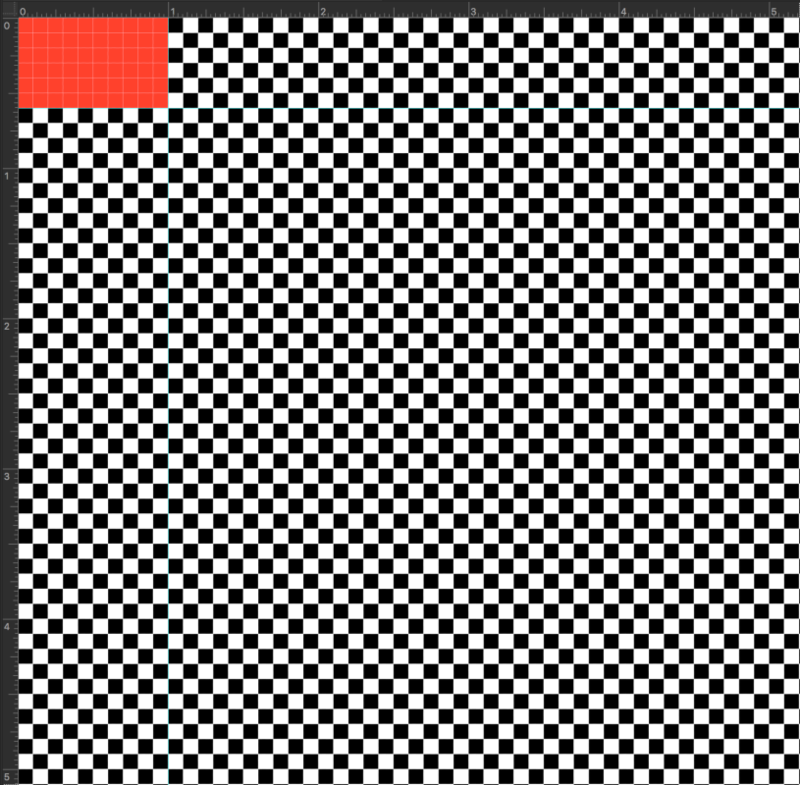 Rulers are in inches…The red box is equivalent of “62 people” approximately, via 60 total pixels in the grid where each pixel equals a person in this comparison. 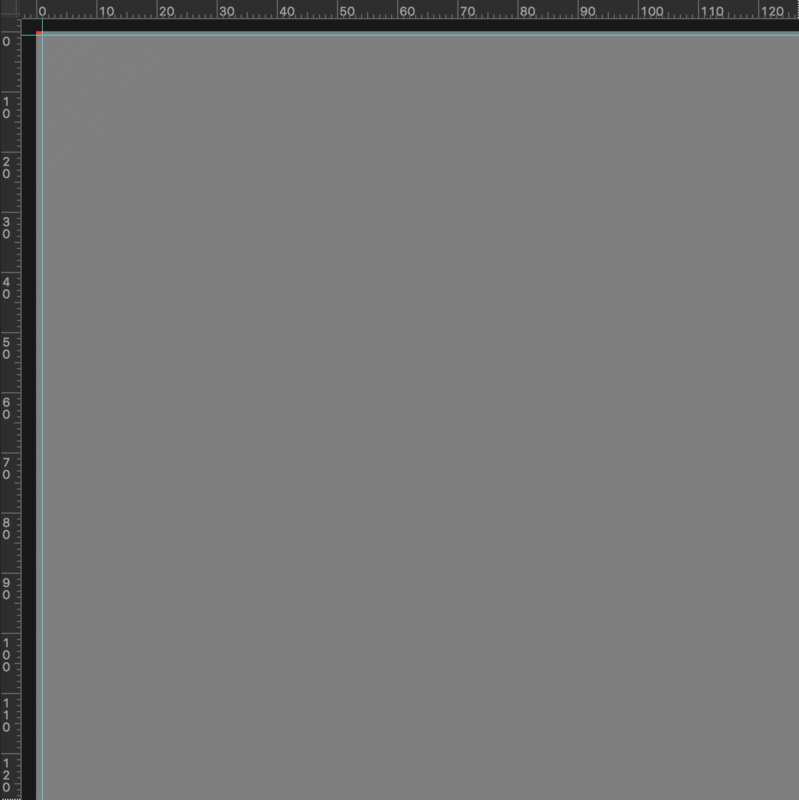 The red box is still the equivalent of “62 people” approximately, via 60 total pixels in the grid where each pixel equals a person in this comparison. The rulers are still in inches, but zoomed out to show about ten feet worth of the 500 foot print. And it’s again a blur of gray noise. Which happens to be a print that is 493 feet per side. So…you’d need a 50 story tall building to display just the height of it…and the building would have to be 500 feet wide as well. And you’d still just see a blur of gray noise unless you walked up to half arm’s length. So this 493 foot by 493 foot print, with 3.5 billion pixels, printed at 10 pixels per inch…would require a 50 story building that is just as wide as it is tall to show how many people hold the same amount of wealth as 62 people…which on that print, would fit into an area that is 1 inch by about 5/8 of an inch. So now back to the drawing board for Part 2, which I’ll link to once I figure it out and write it up. It might take a while. 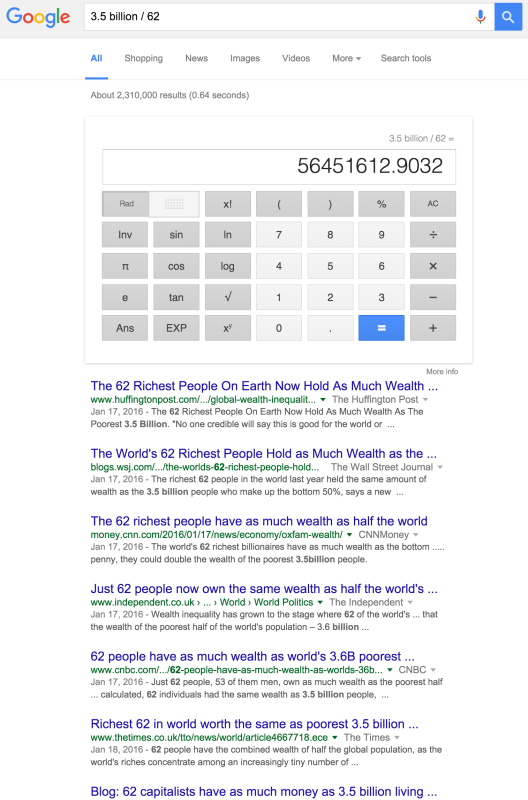 I’ve got a photo shoot in mind that will perhaps shine some light on how we can visualize these numbers – and really grok the disparity between the ultra-rich and the rest of us. The long and short of it is that the concentration of wealth has always been held by a precious few for most of history. It’s just that in just a few short years, that concentration has been cause for the world’s economy to suffer greatly and begin grinding its gears to a full stop. If half of the world’s wealth is held by only 62 people now, at a rapidly increasing rate of concentration, it will be held by under 10 people in a couple years, and eventually by under 5…and eventually…by just one person. Which means it’s not in circulation. Rather than the $250 Trillion in total wealth being evenly distributed as $35,000 per person on the planet…a handful of people will hold half of it, and the other 7 billion people will be able to access even less than they can now under even the best of circumstances. Perhaps visualizing this won’t change things. But perhaps finding a way to really understand the disparity in this inequality will at least increase awareness as to how rigged the system is, and how it’s stacked against the common folk. And then, just maybe, we in the middle class can begin affecting some change to the system at large with the knowledge of what is real.